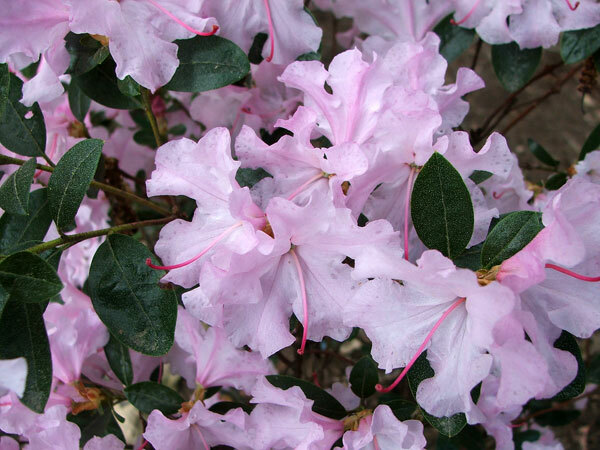 Some rhododendrons are born fussy. Top quality free-draining mulched soil? They sulk. Water? There's either too much, or too little... Sun - aargh! Shade - aargh! Spring Dance has been a pleasant rhododendron surprise. This smallish rhododendron came from a bargain bin, and I planted it behind the pond. There's no irrigation, apart from the odd friendly bucket of pond water, and little hope for fancy food. Home-made compost is the only extra - it's dusty and twiggy, and does little to inspire me, let alone a rhododendron. But Spring Dance doesn't seem to notice. Each year, quite early in the spring season, it bursts out and covers itself completely in pale lilac flowers. It's such a beautiful sight, sitting there in super-sandy soil, surrounded by the toughest shrubs on the country block. Is this a fragile, wafting dance? No way. The flowers last longer than the nearby plum tree blossom, and the wind doesn't feature. 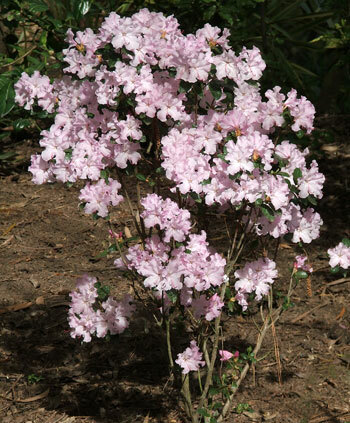 Spring Dance is an USA raised rhododendron hybrid, and flowers in the middle of spring.